Larry says this isn't true. Which part isn't true? 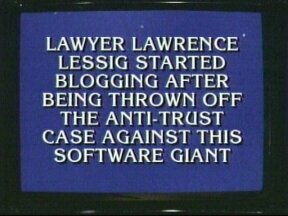 That this was on Jeopardy or that this was the reason he started blogging? That it was the reason he started blogging I think. It WAS on Jeopardy. And, uh, what was the question? Well, chronologically, if he was thrown off the antitrust case first, then at some later date began blogging, it would be technically true. They never actually say he started blogging because he was thrown off; though, it is certainly implied. Just curious - how much was that question "worth" in the game? 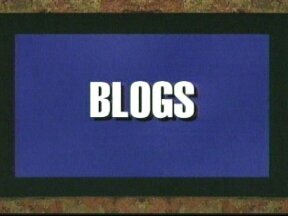 Listed below are links to blogs that reference this entry: Lessig question in Jeopardy Blogs category. Joi Ito - "Lessig question in Jeopardy Blogs category" by Joi Ito is licensed under a Creative Commons Attribution 4.0 International License.